Writing a job description and waiting for applications hasn't been enough for a long time. Instead, recruitment has more and more interfaces within a company, and must remain both technologically and methodologically up to date. The cultural fit is crucial for successfully integrating a new employee into the team. Attraction & Acquisition: Recruiting needs a “WHY”! If you want to build an air taxi, don't gather people who want to forge light metal, solder circuit boards or write software. Teach them to dream of far-reaching, endless mobility! We don't mean it literally, but this advice from Antoine de Saint-Exupery’s writings illustrates something that trips up many companies today: They are lacking an authentic, well-told story to draw employees to them. The question is: How do you attract talented individuals and get them excited about something? Companies vary widely from one another and so do their recruiting strategies. But there is one thing that they all have in common: In a time when skills are in short supply, it is increasingly harder to find the right employees. Requirements are become ever more complex. However, recruiters also dispose of a continuously expanding arsenal of methods to help them find the best candidates. Writing a job description and waiting for applications hasn't been enough for a long time. Instead, recruitment has more and more interfaces within a company, and must remain both technologically and methodologically up to date. Themes like employer branding, social (media) recruiting, and candidate experience are gaining increasing importance. At the same time, HR has the unique opportunity of being able to spearhead the company’s initiatives: as companies fight over talent, successful recruitment and talent management can be decisive in winning the war. Whoever finds and hires the best employees secures a market advantage. 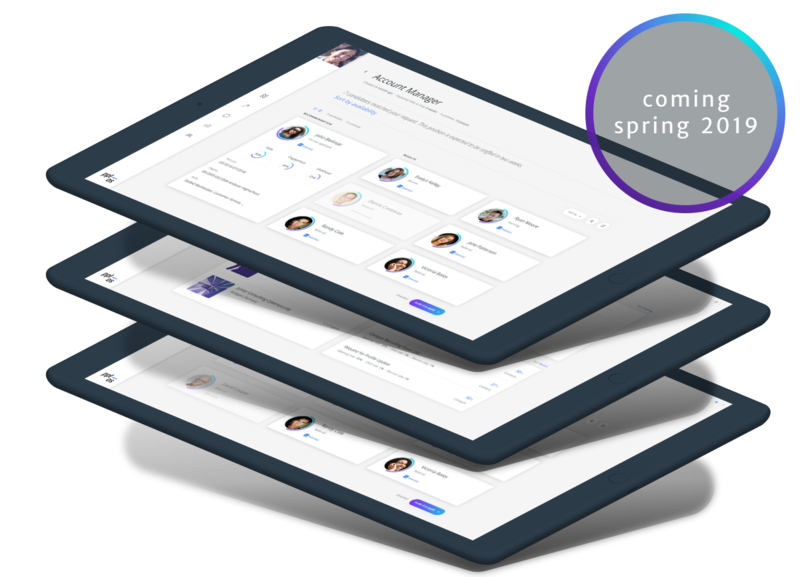 The goal: To reach the right talent and make their application as simple as possible. The quicker the organizational aspects are dealt with, the more time is left for personal contact with applicants. Building a strong employer brand is just as important as efficient application management. Today, the recruitment process must account for the individual concerns and interests of very diverse groups of applicants. One important aspect in selecting candidates is cultural fit. It is crucial for successfully integrating a new employee into the team. For a company to be able to develop nimbly and successfully, its teams should be as heterogeneous as possible while still fostering an optimal team culture. One way to ensure this, while also improving candidate experience, is Team Recruiting. Actively approaching candidates, perhaps with the support of professional recruiters, is the first step in towards talent acquisition. Some potential candidates feel flattered by direct inquiries. Others may find unsolicited offers annoying. This means finding the right way to contact candidates and start the conversation is crucial. 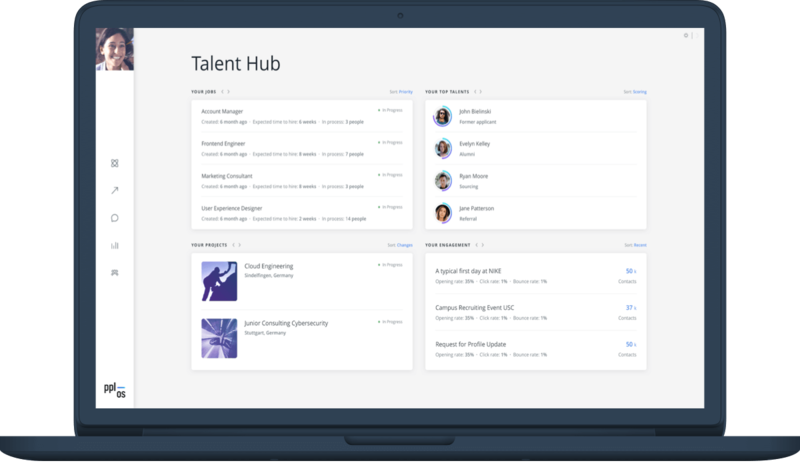 Building a talent pool and maintaining contact with prior candidates is a promising approach in talent acquisition. Investing in talent attraction has even more long-term benefits. Above all, Employer branding greatly impacts a company’s ability to attract highly-qualified applicants. Recruitment looks to marketing for answers to questions like: “Why do applicants want to work here?” and “What can we offer potential applicants, which our competitors don&#39;t offer?” The employer becomes a brand, which the applicant consciously chooses. Talent acquisition and attraction are in no way mutually exclusive. 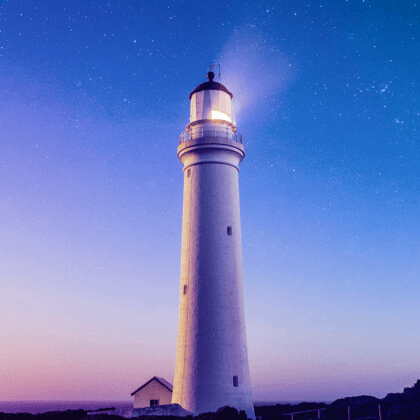 It’s not about choosing one over the other, but they differ in more than just tone: “Acquiring” talent implies that it is viewed as a renewable, purchasable resource. Whereas seeing of talent as something that companies can “attract” and must convince is much more appropriate in today's circumstances. Talent attraction is a proactive approach towards recruiting. It means the first steps for rapid recruitment are already taken care of, before a position even needs to be filled. But how should you set up your organization in order to draw in talent? This kind of organization needs an employee-centered operating system. Because a company’s success depends on its people, and their interactions. Empathy, emotional intelligence, and evaluation are the key skills for leadership and HR professionals, and these won’t be replaced by software processes soon. An attractive organization must understand its employees’ needs. And it must allow them to do what they really, truly want to do. It’s been a while since foosball tables and free coffee were enough to turn a company into an employer brand. Instead, the best employers find a way to create meaning. That’s how talent attraction works, because good stories – whether they're told online or around a campfire – have always been a magnet for people. The Attraction & Acquisition Solution Package intelligently compares concrete staffing needs with a pool of available profiles and creates a selection of potential applicants, who can then be contacted directly. This means vacant positions can be filled quickly and effectively with the right people. Naturally, the pool of potential applicants also continues to grow. The employer dominated jobmarket is outdated, today the applicant rules the game. The traditional monodirectional career is being replaced by multioptional and highly individualized development paths. It has never been that complex a challenge to win the right employees - and it has never been that time critical as it is today. 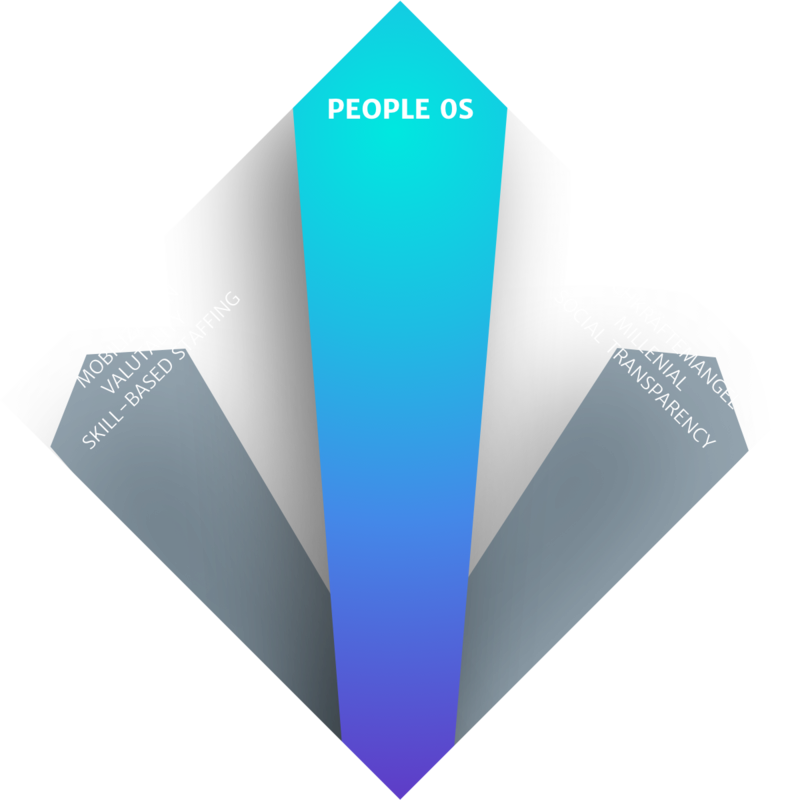 People.OS is built to solve these challenges and helps you to make them work for you. 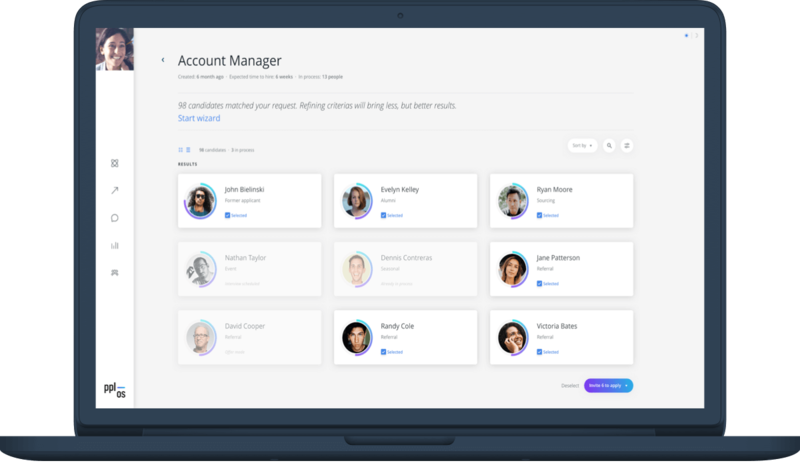 Recruiters log into a separate section of People.OS, where they can access a quick, efficient overview of open positions to be filled, top talents, not just applicants, but also including current and former employees, staff numbers and ongoing campaigns and their status. It also allows recruiters to get in touch with talent directly. In People.OS, profiles are automatically generated using application data, which then serve to create personal brands. This turns employees – including existing staff in particular – into brands. With the Recruiter/ Hiring Manager Cockpit, users can quickly browse through the Talent Pool, which displays appropriate candidates according to how well they fit the requirements. In addition to being able to filter searches, the system also makes suggestions for further improving search results. With just one click, you can invite all eligible candidates to apply.